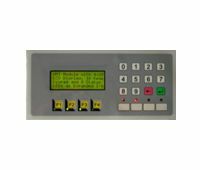 The MD-HMI comprises one 4 lines x 20 characters backlit LCD display; a 16 keys keypad and 8 LEDs. This module is plugged into the LCD port and the expansion port of the PLC. It does not use up any of the PLC's I/O. The keys and the LEDs appear as expanded I/Os to the CPU. ▸ Numeric keypad data entry is much easier. ▸ Professional looking front bezel. ▸ A standard Lexan cover is included, but OEM users could also make their own customized Lexan cover.